In Photoshop Elements, Edit Quick mode is a pared-down version of Edit Full mode that provides basic fixing tools along with a few unique features, such as a before-and-after preview of your image. Select one or more photos in the Organizer, click Fix in the upper-right side of the application window, and then choose Quick Photo Edit from the drop-down menu. Or, if you’re in Edit Full mode, select your desired image(s) from the Project Bin and then select the Edit Quick button in the upper-right area of the application window. Note that you can also open images by simply choosing File→Open. Specify your preview preference from the View pop-up menu at the bottom of the application window. You can choose to view just your original image (Before Only), your fixed image (After Only), or both images side by side (Before & After) in either portrait (Vertical) or landscape (Horizontal) orientation. 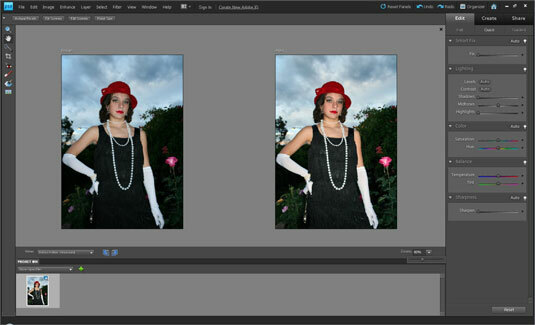 Edit Quick mode enables you to view before-and-after previews of your image. Use the Zoom and Hand tools to magnify and navigate around your image. You can also specify the Zoom percentage by using the Zoom slider at the bottom right of the application window. Choose your desired window view by selecting one of the following buttons located in the top-left corner of the application window: Actual Pixels, Fit Screen, Fill Screen, or Print Size. Crop your image by using the Crop tool on the Tools panel. To rotate the image in 90-degree increments, click the Rotate Left or Rotate Right button at the bottom of the application window. Apply any necessary auto fixes, such as Auto Smart Fix, Auto Levels, Auto Contrast, or Auto Color Correction. All these commands are on the Enhance menu or in the Smart Fix, Lighting, Color, and Balance sections on the Quick Fix pane in the Panel bin. Usually one of the fixes is enough. Don’t stack them on top of each other. If one doesn’t work, click the Reset button in the top-right corner of the image preview and try another. If the auto fixes don’t quite cut it, get more control by using the sliders available for Smart Fix, Levels, Contrast, and Color, located in the Quick Fix pane. Shadows: When you drag the slider to the right, lightens the darker areas of your image without adjusting the highlights. Highlights: When you drag the slider to the right, darkens the lighter areas of your image without adjusting the shadows. Midtone: Adjusts the contrast of the middle (gray) values and leaves the highlights and shadows as they are. Saturation: Adjusts the intensity of the colors. Hue: Changes all colors in an image. Make a selection first to change the color of just one or more elements. Otherwise, use restraint with this adjustment. Temperature: Adjusts the colors to make them warmer (red) or cooler (blue). You can use this adjustment to correct skin tones or to correct overly cool images (such as snowy winter photos) or overly warm images (such as photos shot at sunset or sunrise). Tint: Adjusts the tint after you adjust temperature to make the color more green or magenta. Add finishing fixes by using the remaining tools in the Tools panel. Red Eye Removal tool: Try the Auto Red Eye Fix to remove red eye. If this doesn’t work, try using the Red Eye Removal tool. Whiten Teeth: This fix does what it says — it whitens teeth. Be sure to choose an appropriate brush size from the Brushes drop-down panel before whitening. Click the teeth. Note that this tool makes a selection and whitens simultaneously. When you’re done, choose Select→Deselect or press Ctrl+D (cmd+D on the Mac). Make Dull Skies Blue: Click or drag over areas of your sky that need brightening. Choose a brush size and selection option. When you click your sky, it’s selected and brightened at the same time. When you’re done, choose Select→Deselect or press Ctrl+D (cmd+D on the Mac). Black and White – High Contrast: This tool converts your image into a high-contrast grayscale image. 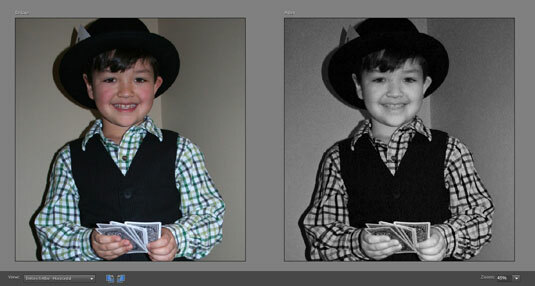 The following figure shows a color image converted into a grayscale image that looks like a vintage newspaper photo. The Black and White – High Contrast fix converts a color image into a grayscale one. Note that you can find these same fixes (and many more) in Edit Full mode, under the Smart Brush and Detail Smart Brush tools. Sharpen your image either automatically (by clicking the Sharpen Auto button under Details in the Quick Fix pane) or manually (by dragging the slider on the Sharpen panel). This fix should always be the last adjustment you make on your image.